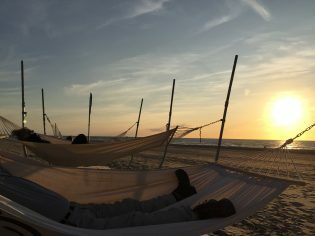 The Plunge (Liebeswellen in German) is our new on-location cultural project, an audio tour with a difference that takes you on a fascinating literary walk through the coastal resort of Scheveningen. An experience for all the senses! The Plunge centres around German composer Felix Mendelssohn Bartholdy, who came to Scheveningen in 1836 in the hope of restoring his failing health. He was also wrestling with matters of the heart: having fallen for young Cécile Jeanrenaud, Felix spent much of his visit pondering his feelings and considering whether he should marry her. Scheveningen became the setting for a soul-searching interlude in his life. Especially for this project, director Ingrid van Frankenhuyzen invited acclaimed Dutch novelist Marente de Moor to write a brand new short story inspired by Mendelssohn’s sojourn on the Dutch coast. 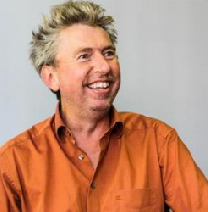 De Moor, winner of the European Union Prize for Literature, has written two exquisite interlocking tales – one for grown-ups and one for children aged six and over. Including newly composed soundscapes. At the start of the tour at the Pier, we provide you with an MP3 player and headset. In English, German or Dutch. You then embark on what at first seems to be an ordinary walk, until you reach three dramatic locations designed for sitting and listening. Each location affords its own special view of the sea. 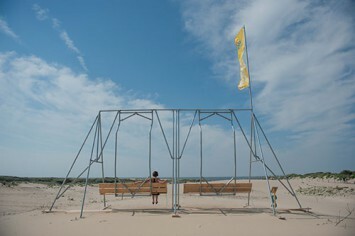 One of the locations includes porch swing the ZlowMotion, a Dutch Design Week item, designed by Pink Steenvoorden. We're open daily on weekdays from 11.00 till 17.00 (last departure), weekends from 10.00 till 17.00 (last departure). More information: see above The Plunge. Dutch news paper De Volkskrant in 2014 reviewed the predecessor project Oh The Sea"....Oh The Sea is an exceptional sensory experience." Four star reviews for The Plunge In a number of media, The Plunge was awarded with several ****-reviews. 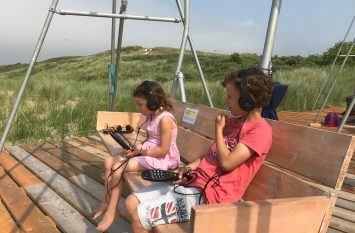 Of course in Dutch media but the praise mainly contained the notion of being drawn into a hypnotic world of the story and soundscape whilst seeing a modern beach life in front of you. The route of The Plunge has been approved This will be the route. Each location affords its own special view of the sea. 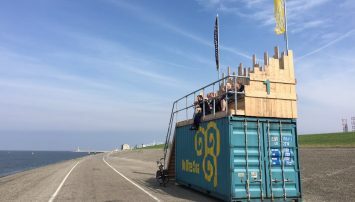 The stops, for sitting and listening, consist of theatrically designed installations and are located at the famous Kurhaus, The Meteo Tower on top of the dune at the ‘Zwarte Pad’ and in the dunes near beach pavilion Oscars. 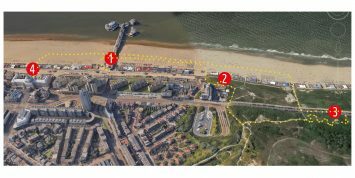 New project The Plunge in Scheveningen 2018 As Scheveningen Bad exists 200 years in 2018, we start a new location project/ audio walking tour based on a historical fact: composer Felix Mendelssohn Bartholdy residing in Scheveningen in 1836. 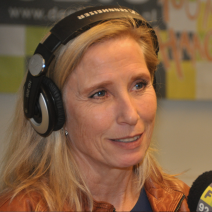 Award winning author Marente de Moor will write her version of this event. Director: Ingrid van Frankenhuyzen, design: Pink Steenvoorden. Oh The Sea succesfully started in Den Helder 2017 Oh The Sea arrived in Dutch navy town Den Helder this summer. Walk along the dyke with views to the island Texel and beyond. Start at Restaurant Stoom near the theatre at Willemsoord, every day from July 7 till September 3, between 11 and 18h.